Paul Cooper (left) National Projects Director for the International Children’s Football Alliance presents Matti Vandemeale (right) Director of The Peace Village, with Bainbridge Island Football Club’s Peace Field Project Plaque. Bainbridge Island Football Club, Seattle, USA are the first soccer club in the States of America to twin their soccer pitch with Flander’s Peace Field, site of the 1914 Christmas Truces. 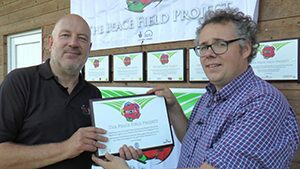 Paul Cooper, National Projects Director at The International Children’s Football Allaince presented Matti Vandemeale, Director of The Peace Village, BIFC’s Peace Field Project Plaque on the United Nations International Day of Peace (21st September, 2016) in Messines, Belgium.